Neill is often asked where he finds inspiration for his floral designs. With Easter just around the corner, Neill shares his love of Belgravia, home of the Neill Strain Floral Couture boutique, and explains how the area's majestic architecture and centenary gardens are the primary source of inspiration for this year's Easter Collection. As many of you know, Neill Strain Floral Couture is approaching its tenth anniversary in Belgravia. I opened my first store in London's most chic residential district in 2008 and it has been a love affair ever since. When I can escape from the business to walk around the area and enjoy the stately architecture, the glorious Garden Squares, not to mention the haute couture boutiques, it is a great source of inspiration for my designs, those we sell at our boutique and also for the wedding and event work we create at our design studio. 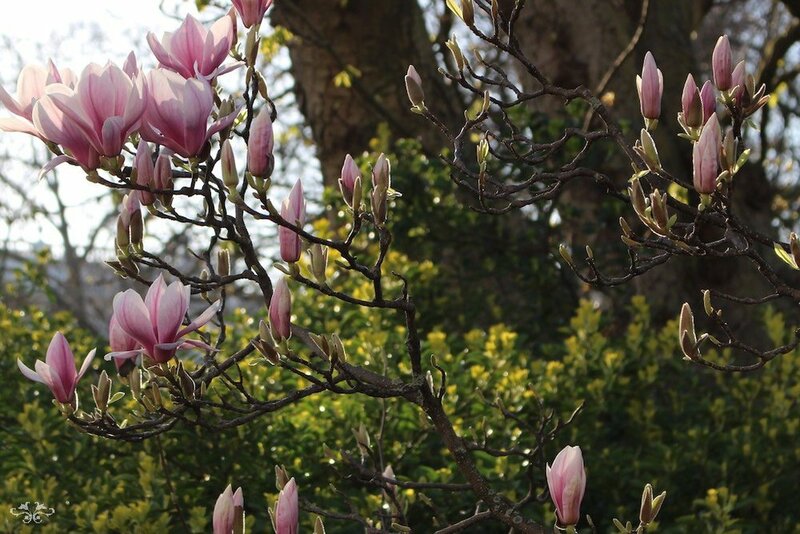 Hence, I thought I would share with you in this blog post the incredible beauty of Belgravia in springtime and how this has inspired me for our Easter Collection 2017. Belgravia was born in the 1820s. The builder, Thomas Cubitt, was responsible for laying out most of the original plans for the area working with different architects and even in its early developments, Belgravia was one of London's most fashionable residential districts. The focus was mostly on terraces of white stucco fronted buildings with the focal points being Belgrave Square and Eaton Square. 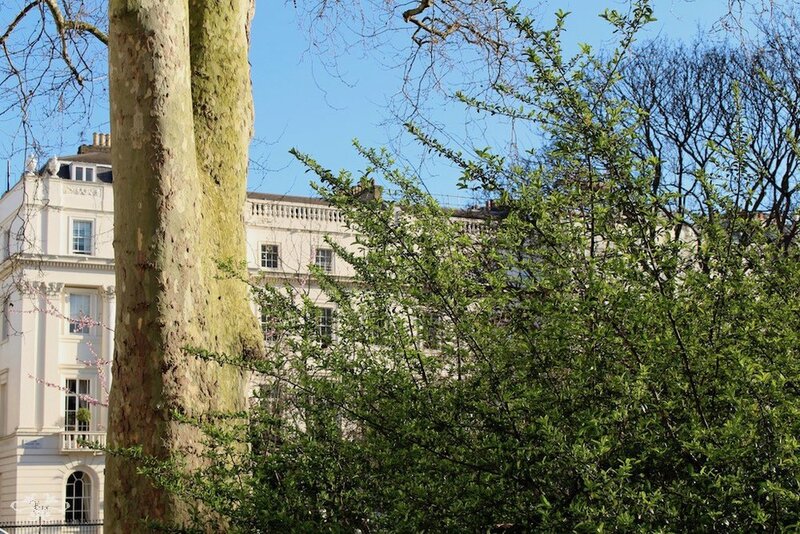 Our boutique is just a few meters from Belgrave Square where the magnificent gardens against a backdrop of exquisite architecture are inspirational at any time of the year. 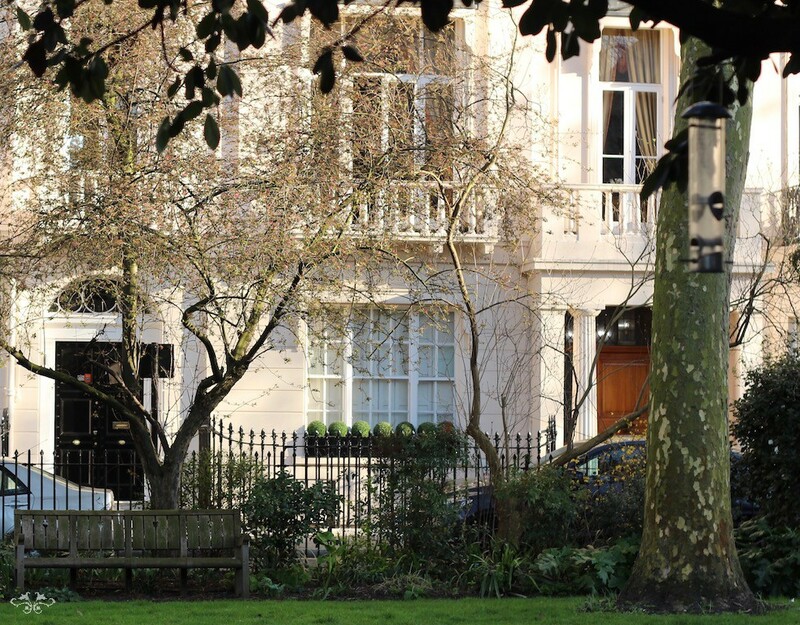 The elegant architecture of Belgravia is accentuated by its magnificent Garden Squares. Belgrave Square was one of the largest and grandest Squares of the 19th century. 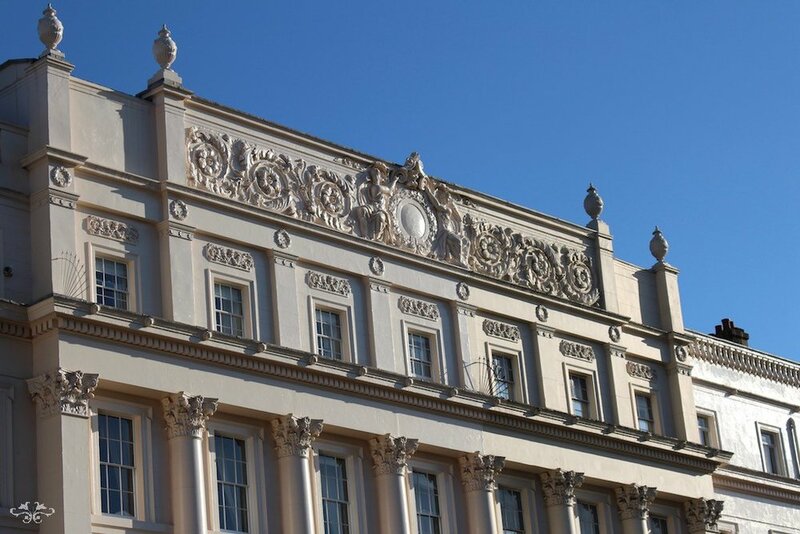 It was built for the second Earl Grosvenor by Thomas Cubitt; the four terraces that outline the Square were designed by architects George Basevi while Philip Hardwick and Robert Smirke designed the corner mansions. Today, most of Belgravia is owned by the Duke of Westminster’s Grosvenor Group, the Grosvenor Estate, named after one of the Duke’s subsidiary titles, Viscount Belgrave. It is said that Belgravia is one of the world's wealthiest districts with some of the most expensive houses anywhere in the world, some priced around £100 million. Nevertheless, it is sometimes the simple blooms of Magnolia in the gardens that I love most. Kerria Japonica, fruit tree blossom, Camellia and Ribes Sanguinea (below) together with lots of other new growth create a spectacular display of colour on a spring day. When designing with flowers, we work with colour, texture, lines and form. In the gardens, I delight in the natural colours of the blooms and foliages, the lines of the tree branches combined with the rigid forms of the architecture and the many elegant statues that create focal points in the gardens. Belgravia is also renowned for its black iron railings. We have these in front of the boutique so I particularly enjoy seeing how nature conquers these solid lines and the fabulous effect of combining harsh man-made materials with soft, delicate flowers, an effect we sometimes create with our large floral installations. And while flowers adorn the ground, the new growth in tints and tones of lime green adorns the trees creating extraordinary lines and textures. I find the beauty of tree bark against the white stucco fronted buildings is also an exciting contrast of textures and lines, a contrast I seek to recreate in my floral designs to give that unexpected "wow" factor. Of course, such an exceptional residential district has been and remains the home of many famous people. Prime Ministers, artists, composers, actresses and poets have been notable residents, such as Stanley Baldwin, Chopin, Mozart, Dame Edith Evans, Vivien Leigh, Alfred Lord Tennyson, Ian Fleming, Sean Connery, Roger Moore, Christopher Lee, Margaret Thatcher and Joan Collins, to name a few. Upstairs Downstairs was filmed here and recently an episode of Mr. Selfridge. Neill Strain Floral Couture is located on West Halkin Street in the heart of Belgravia. While we will have many designs at the boutique inspired by all the images I hope you have enjoyed here for Easter, we also have our online Easter Collection that you can order on our website with delivery throughout central and greater London. 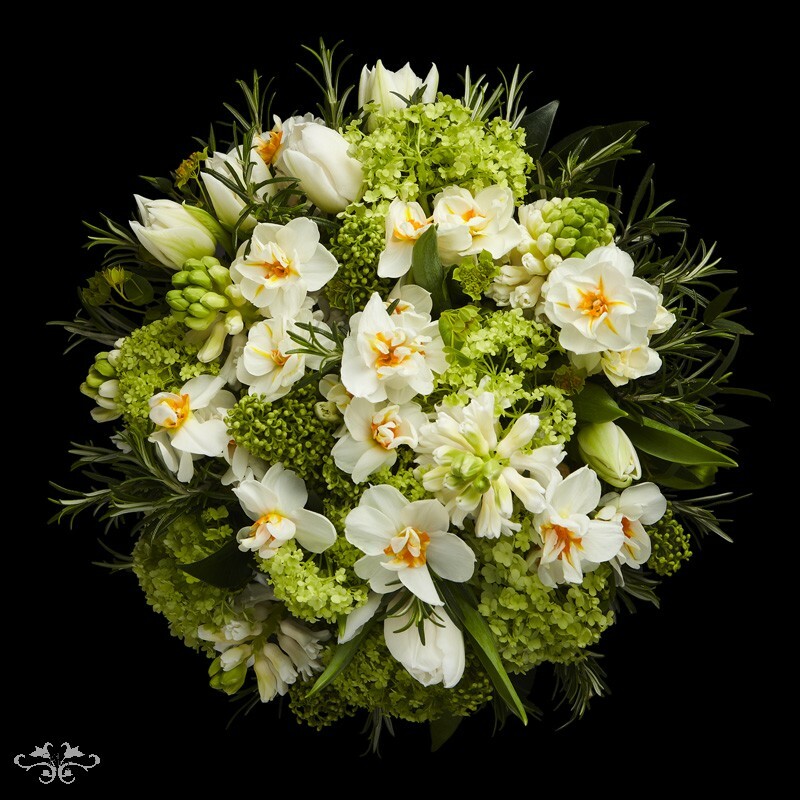 Inspirations from Belgravia for our Easter Collection, now available online with same day deliveries throughout central and greater London. I hope this blog post has demonstrated the passion I have for Belgravia. It is such an inspirational place for a flower boutique. Do pop in to see us and enjoy our designs - and don't forget to take a walk around the area to see for yourself the beauty of Belgravia and its glorious Garden Squares.